AARF... it just might be the cutest acronym ever! 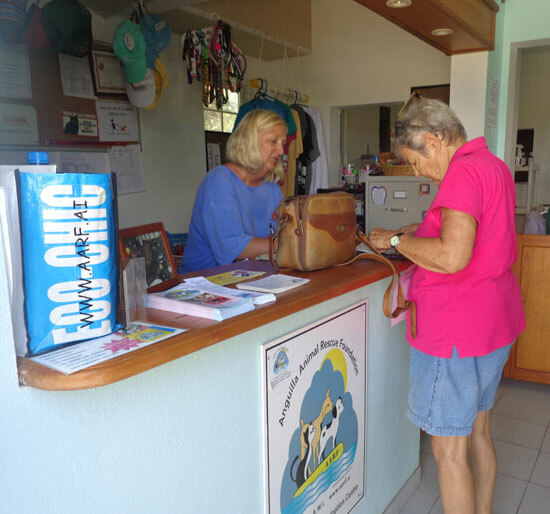 Commonly referred to as AARF, The Anguilla Animal Rescue Foundation (founded in 2000) is the only one of its kind in Anguilla. 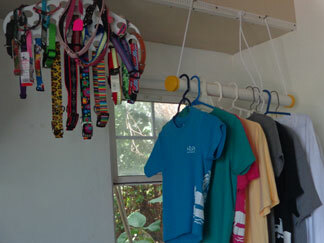 AARF is a non-profit, focusing on the welfare of dogs, puppies, cats, and kittens on the island. Click for a few AARF adoption stories that will surely make you smile. "Regal" jumps up to say hello! cleaning, grooming, walks, adoptions, pet travel arrangements, etc. The day I went and met with Suzi at AARF, I found the cages and pens to be immaculate. Fortunately when I was there, there were only 4 kittens and 2 puppies available. Some months, there may be up to as many as 25+ puppies and that is a challenge to find homes for so many. 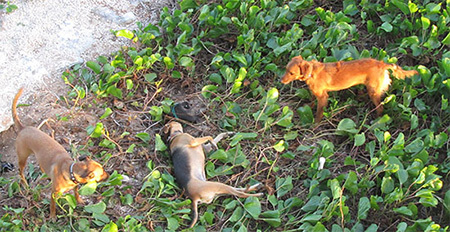 If you've spent any time on the island of Anguilla, and especially if you have explored, you are sure to see that the dog and cat population is not well-controlled. 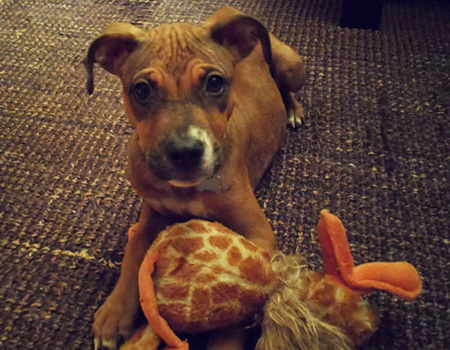 This adorable puppy is ready for a new home! This situation is not isolated to Anguilla, of course. 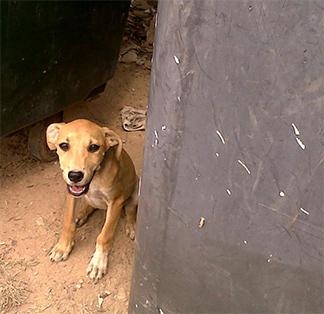 Nevertheless, sadly, in time, dogs and cats do get run over by vehicles, and are pushed to the side of the road. Many dogs walking with a severe limp, too, as the vehicle only maimed them. Tired, unhealthy female dogs walk along the road, reeling from what is not likely to have been their first or even their second litter. For those who see these types as animals as potential loving companions/family members, it is a heartwrenching sight. There are many who have and continue to help give these animals a better life, a loving and healthy life and it all starts with AARF. Alycia's Sandy Rose... From Anguilla to New York City! My boyfriend and I live in New York City and have been to Anguilla twice a year for several years now. We had heard about AARF several times. On our 5th trip we discussed the possibility of adopting a puppy from there, but still had some cold feet and knew it was a big responsibility. After returning home from a visit to Anguilla, we checked AARFs website from time to time to see all the cute animals that needed a home. Our next trip to Anguilla, a 2 week family trip, and after a nice leisurely lunch at Straw Hat we had decided to make an impromptu trip to AARF (on our 2nd to last day). We had our eye on 2 puppies who were very good friends, Jimmy and Rosie. Jimmy had already been adopted and Rosie was very cute, gentle and happy to see us. The next morning we met Suzi at AARF and picked Rosie up and then headed back to the hotel to pack up and begin our journey home. The travel was pretty easy, and she was a little scared. After the ferry, lunch in Marigot, and a 4 hour direct Jet Blue flight she was home! She was pretty exhausted (as were we) but luckily there is a Petco right across the street from our apartment where we picked up all sorts of puppy necessities the next morning. We also decided to name her “Sandy Rose”, and made her a little doggie tag in the shape of a bone at Petco with her name on it, which we attached to her pink pirate collar (she is a Caribbean dog after all)! We've only had her several weeks now but she loves it here. She wags her little tail all day long. We go for long walks in Central Park almost every day and she meets new doggie friends. She is the sweetest puppy ever, very loving, loyal and playful. She holds her head high and walks very proud, and is not afraid to play with the BIG dogs. On one of our first walks with her in Central Park, a man and his dog came over to say hello and told us that “a dog changes your life forever.” He then proceeded to give us a lot of puppy advice, which we appreciated. Sandy Rose's first two weeks as NYC dog included a visit to her new vet Dr. Raznick for shots, 2 baths, 3 cozy naps in our bed, ate 4 edible Nyla Bones, learned how to “sit” on command in 5 days, stole cat toys from Tori (our cat) 6 times, obtained 7 hours of sleep each night, made 8 close doggie friends already, has been to Petco 9 times (I swear), and has accumulated a total of 10 puppy toys! As each day goes by and she gets a little bigger and smarter, and we slow down our hectic lives and enjoy our long walks and playtime together, we can see now what he was talking about. She is the best souvenir from Anguilla that we have ever had! 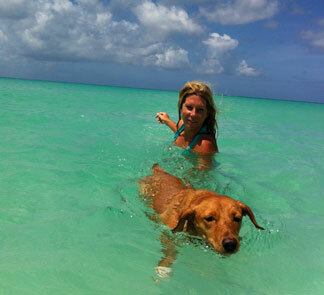 I love Alycia's story of making a wonderful difference for the life of a sweet Anguillian dog! It's a easy addition that makes a huge, positive impact on many lives. Now here's my story of adopting a dog vs. a little puppy. I had my golden retriever, Tucker, for almost thirteen years. I love dogs and knew I might want another one some day but to me, Tucker was perfect. I was worried I might try too hard to make comparisons if I got another dog. I had also wanted to make a lifestyle change, slow down my career, and hope to live where I had many friends, building a life in Anguilla. I had said, if I ever got to move to Anguilla, I would love to have time to volunteer and I wanted to adopt a "long dog". Fast forward a couple of years and I got to move to Anguilla. Not even a month after moving, my friend (who knew I might want a dog), called me and said, "Kristin, there is a long dog at AARF". I jokingly scolded her for enlightening me so soon after moving. I waited a day before I went the AARF website to see a picture of the dog they had named, "Florence". Each month, AARF changes their theme for names of the dogs and cats that come in. The month that "Florence" was brought in, the theme was "Cities Around The World". Florence looked cute and timid in her pictures. 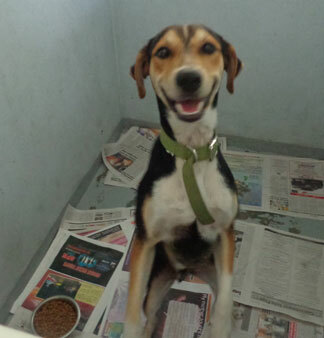 She, unlike most at AARF, was not a little puppy. She has some months on her and was considered an older dog for what the majority of AARF's adoptions are. 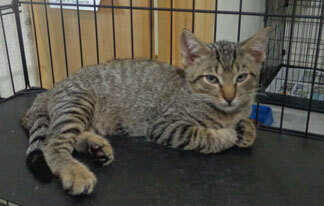 They were also worried she may not be easily adopted because, however sweet, she was very timid. Many of the dogs that come to AARF are female, as many males on the island tend to be kept more often where more females are cast aside or brought to AARF. I hear many of these dogs are dropped off at the dump too. The small puppies go out for adoption a lot easier than the older dogs that may be not as easily trained or just aren't as small and cute. Knowing all of this, the next day I found myself looking at the website again and then making a phone call to ask about Florence. I spoke with AARF volunteer, Rebecca who also has owned a golden retriever. She was so honest with the differences I might have with adopting a dog who was almost beyond the puppy phase, possibly mistreated, and an "island dog". I'll never forget her words to me, "Kristin, this is not going to be like a golden retriever". She was right. While I will always love "goldens", I needed a different and new type of pet scenario. My next step was to go to AARF and meet Florence. She was in a cage in the back and had the sweetest little face and was very sheepish. I took her home to give her a test over night before deciding if she were to be my next, "baby". I put a doubled over towel on the floor in the corner of my bedroom and she slept on it as if I had told her to. The next morning I took her to Rendezvous Bay and walked with her on a leash from the Anguilla Great House down to the eastern end. I met up with a couple of friends at the eastern end just after I had let Florence off the leash for a moment to see how she would react. I set her free, and turned and walked the opposite direction. She turned and followed me. I looked up and my friend was smiling at me and said, "that's your dog". After our beach trip I went to AARF and signed paperwork for the sweet little long dog now named "Indio" (keeping Florence as her middle name). Florence clearly had a bit of a rough time before becoming my pet. I've had her for almost two years now and she is still very skittish in some circumstances however she's come a long way. She is less comfortable around small children and is very nervous when her food is put out. She'll sometimes jump away from her food if I walk by her while she's eating. She does this less and less, over time. If I'm sitting or come down to her level, she'll be downright cuddly. She's fast, she's funny and very smart. She loves to run on the beach and chase birds around the salt pond, which is her best form of exercise, otherwise she is an indoor dog. A few of the AARF volunteers were worried that she would not be adopted so easily since she was bigger/older and her demeanor needed some help from someone willing to put forth some effort. I'm so glad I considered the challenge. 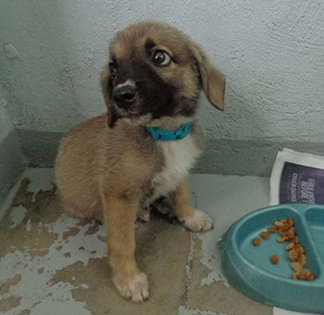 Don't get me wrong, the tiny, fluffy, little puppies that were up for adoption when I met Florence were very tempting. However, I believe I was meant to be with Indio. My little long girl is quite the contrast to my well-commanded, large and regal golden retriever... but that is what I was looking for, a different scenario. I am thankful we were brought together! Lulu, Mimi and Toupsie... The Three Musketeers! Ever since I can remember, I've always wanted a puppy. That's how it goes when you're a kid, right? Unlike other kids on our block though, Yuki and I never did get a cuddly, bundle of joy. With dog allergies, and living in Canada where our house was mostly closed-up, the answer was almost always "no." "How about a Great Pyrenees? We can build a shed with electricity for him so he can live outside." "Maybe a Tea-Cup Chihuahua that could live, penned-in on my home-office desk?" I'm pretty sure his suggestions were made in jest. ;-) As you may have guessed, both were non-starters. Our very first pup, was an AARF pup! 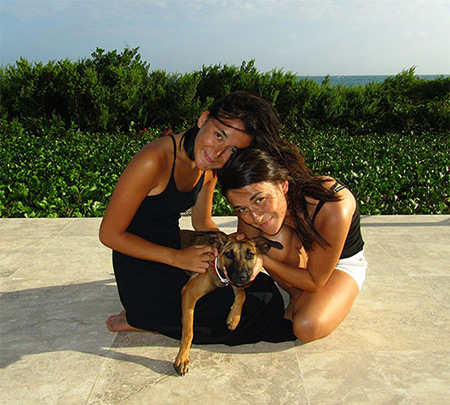 After moving to Anguilla in 2008, we got to know the kind people at AARF. Yuki volunteered there a few times a week, falling in love with puppy after puppy, kitten after kitten. Yuki and I moved to NYC for school in the Fall of 2009. With the house empty, my parents were ready for a pet. My Dad lovingly called her "Toupsie," as in "tout-petit", French for "oh so small." He loved watching her chase her tail day after day when she was a youngster. Obedient and loyal, Toupsie is very much our family pet. 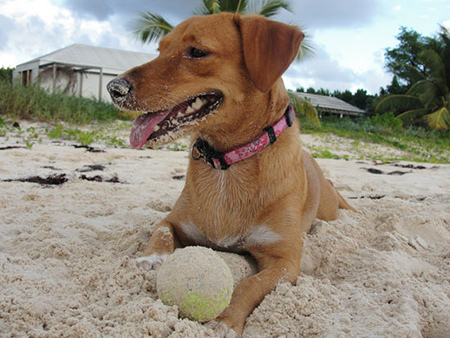 She looks quite like many dogs in Anguilla, being a mix of different breeds, short-haired and medium in size. Six months later, Yuki came home from AARF with another puppy, Mimi. Mimi was so tiny when Yuki brought her home, just over a month old. Quite the opposite of Toupsie, she burst into our house, barking up a storm at anything she didn't know or recognize. That included Toupsie and my Dad! She was supposed to stay just for the night. Little did we know, that night, Yuki had saved her life. The rest of Mimi's litter came down with Parvo and died. Yuki and Mimi were meant to be. Still, to this day, Mimi is never as happy as when Yuki is nearby. 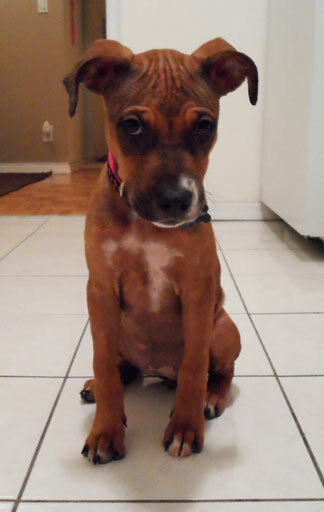 She's built a little like Toupsie, but her square-ish face suggests that she may have some Pitbull in her. She is a smart and fiercely loyal dog, the hunter of the family. She will come home with lizards, birds, mice and full-sized wild chickens. Perhaps the most amusing of Mimi's catches was the 12" Triggerfish she brought home while my Mom was visiting me and Yuki in NYC. My Dad was left feeding the dogs. 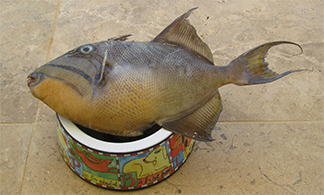 Mimi brought the freshly caught (with all its colors shining) Triggerfish and promptly put it on her supper bowl! Our AARF adoption story doesn't end there. Lulu is our latest addition. She was too precious to say "good-bye" to. Mimi took Lulu under her wing. They have the tightest bond. The sweetest of all the dogs, she is also the loudest. She will bark at anyone who pulls up to the house, and she cannot be bought. Try to offer her a cookie if you're a stranger, and she will only back away, barking louder. Once you know her she is docile and a little hesitant, taking all of her cues from her older sisters. She is the prettiest too, looking like an Irish Setter. Don't tell the others I said so, though! Today, our dogs play outside, taking themselves on walks through our property, and up and down the shoreline in front of our house. They are free and happy pups, each different and equally loved. Looks Like Mimi's Playing Dead! My Mom found this little pup and his sister one evening when taking out the garbage. Hiding under the garbage bins up the road from our house, they were all skin and bones, timid, running from anyone who passed by. They didn't have a home, or much of a hope. My Mom brought them water and food, which they consumed ravenously. She tried to catch them to bring them to AARF, but each attempt was unsuccessful. She recruited Gayle's help, an AARF volunteer. Together, they caught the sister, but the faster brother always escaped their grasp. Puppy food, dog bones, even bacon... nothing would catch this little pup! Finally, our friend Curtis caught him. Together, they brought him to AARF and cleaned him up. Otis was adopted by a sweet and caring couple from New Jersey! Suzi, an AARF volunteer, reported that "He lay down in his carrier as if he knew how important this trip was." 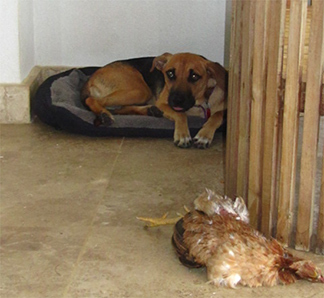 Anguilla Animals Need Your Help! Donations are a key to the survival of this organization. 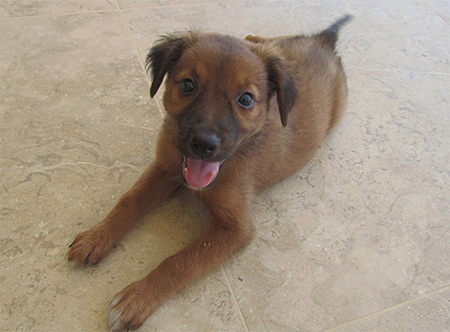 If you are interested in finding out how you can help keep AARF supported by helping with a monetary donation, if you are interested in seeing what pets are available for adoption, or would just like some more information, visit their website here: AARF Anguilla Animal Rescue Foundation.